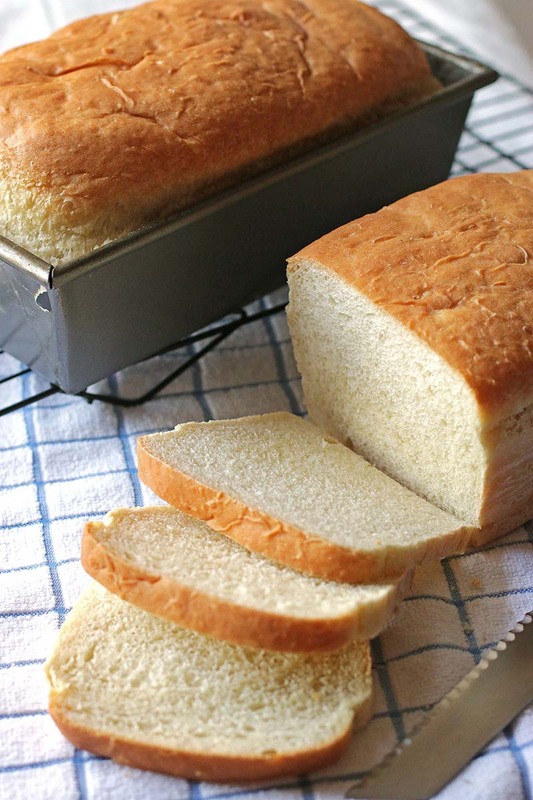 A quick and easy white bread with no kneading required. Perfect for sandwiches! In large mixer bowl, combine 3½ cups flour, yeast, sugar and salt; mix well. Add warm water (120-130°F) and shortening to flour mixture. Blend at low speed until moistened, beat 3 minutes at medium speed. By hand, gradually stir in remaining flour to make a stiff batter. Cover; let rise in warm place until double, about 30 minutes. Stir down batter. Spread in greased 9x5 or 8x4-inch bread pans. Cover; let rise in warm place until batter reaches top of pans, 20 to 30 minutes. Bake at 375°F for 35 to 40 minutes until golden brown. Remove from pans; brush with butter. Cool on wire rack. My husband gobbled it up. I’ll definitely be taking this to my husband’s Battalion potluck! This is my go-to when I want a simple, tasty white bread. Good with soup, good for sandwiches, good for a snack. Thanks, Red Star! Two loaves are a bit much for us two oldies. so will freeze one. hope it works alright with the freezing. husband loved it. not going to buy shop bread ever again. 30 years ago I attempted to make bread..A bird attempted to fly away with it? he went straight down. I just made this bread recipe and I did it! Very good and easy enough even I can do it. Gotta say……..EVERYONE told me how hard it is to make bread. NOT!!!!! I made this in less than TWO HOURS!!!! (BAKING AND ALL!!!) I SO remember my mother years ago slaving over her worktable making bread and occasionally rolls of different kinds. I grew up in a LARGE family of twelve children (YES 12!!!) and we almost never had much money and Mom’s baking day was a day we ALL lived for. FINALLY!!! I get to step back to my growing-up years and enjoy a treat I remember so well. With THIS recipe I will likely never buy bread from the store ever again.